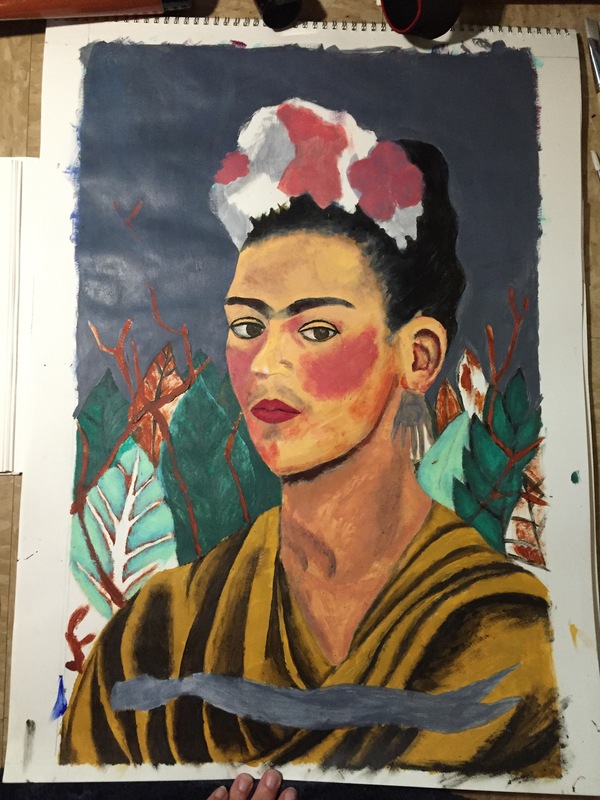 To start this huge project, I began my research and bought my paints. 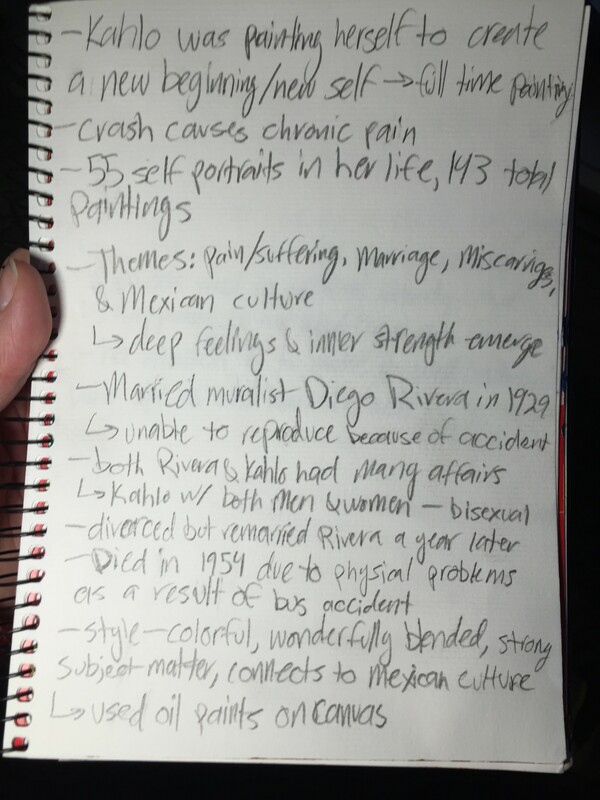 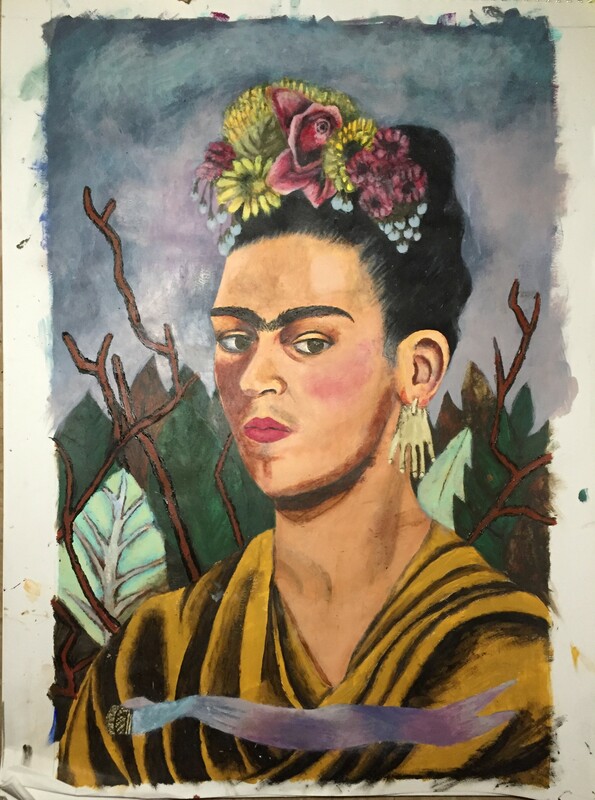 In my sketchbook, I tested out the paint colors to see how they would turn out when dry, and I wrote down some key things I learned about Frida in my research. 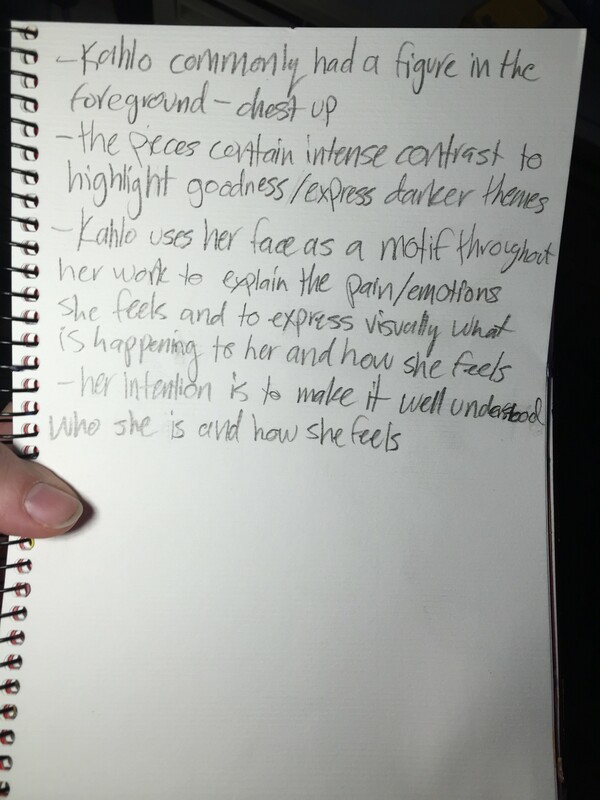 My favorite thing about her is the way she uses her figure to express the emotions she really feels and how she uses her face as a motif to show the things that are happening to her. 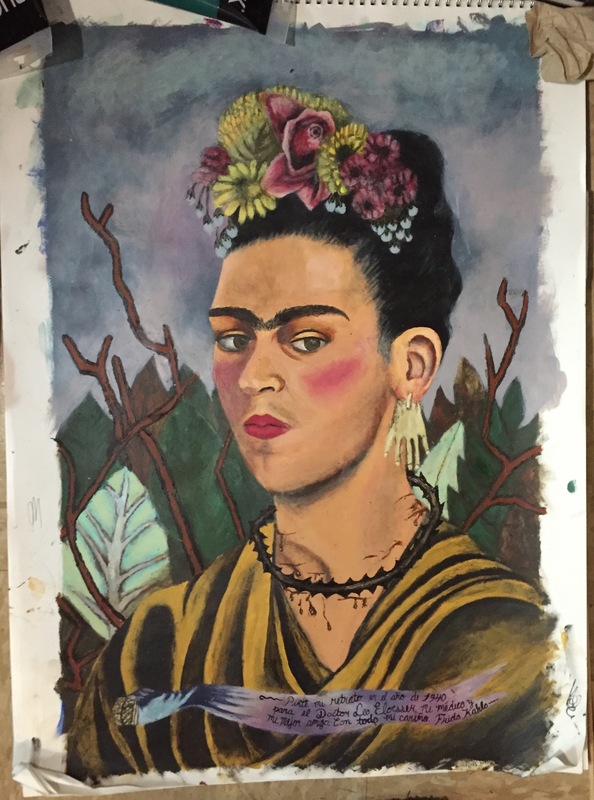 The next step was to plan out the portrait I would recreate. 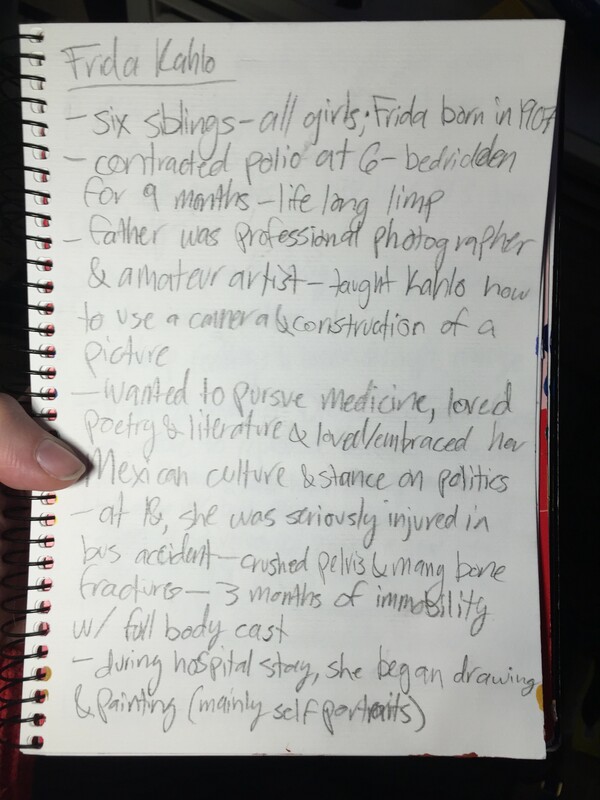 In the book I purchased, a particular portrait of hers stuck out to me. 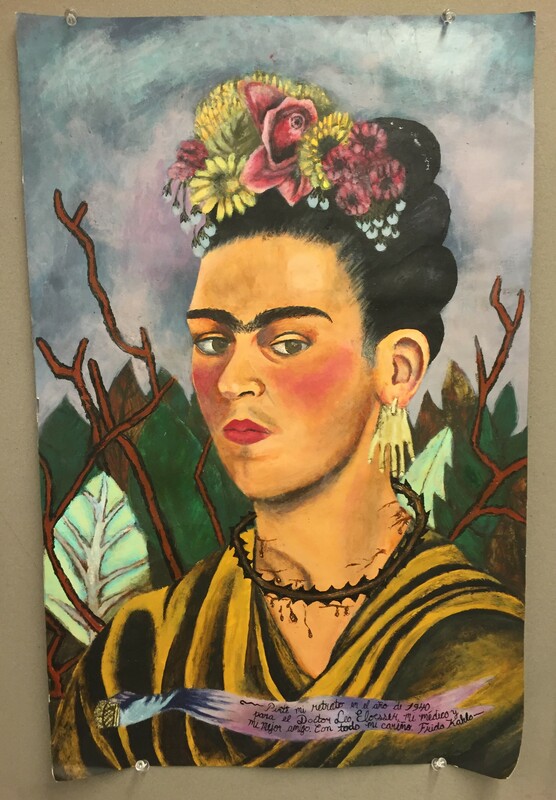 I loved the colors she used and the detail and the wonderful construction of the composition. 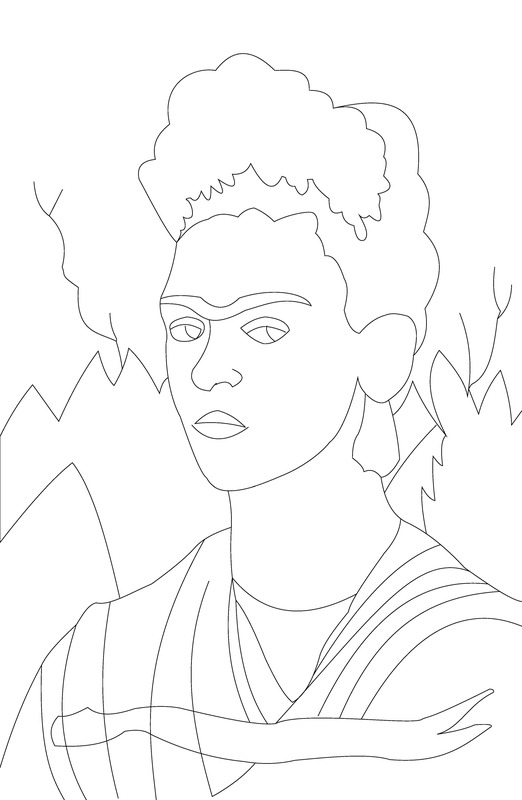 I then took the picture to Illustrator and traced the important lines of the image. 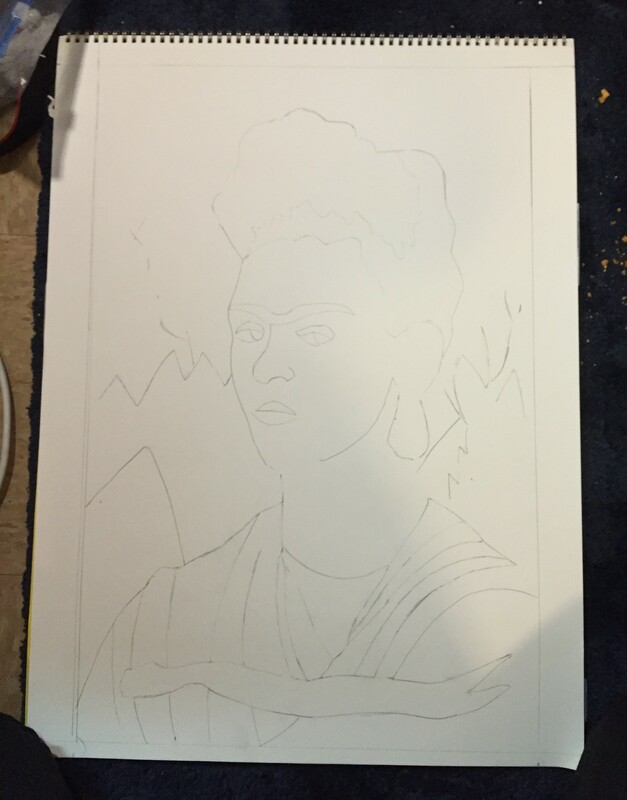 I printed the photo to scale and traced it onto canvas paper. 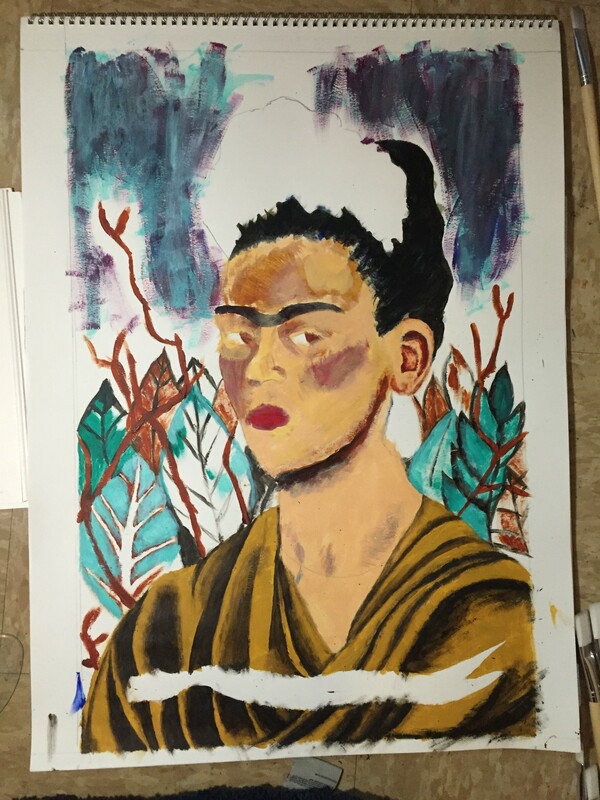 I began painting in layers. 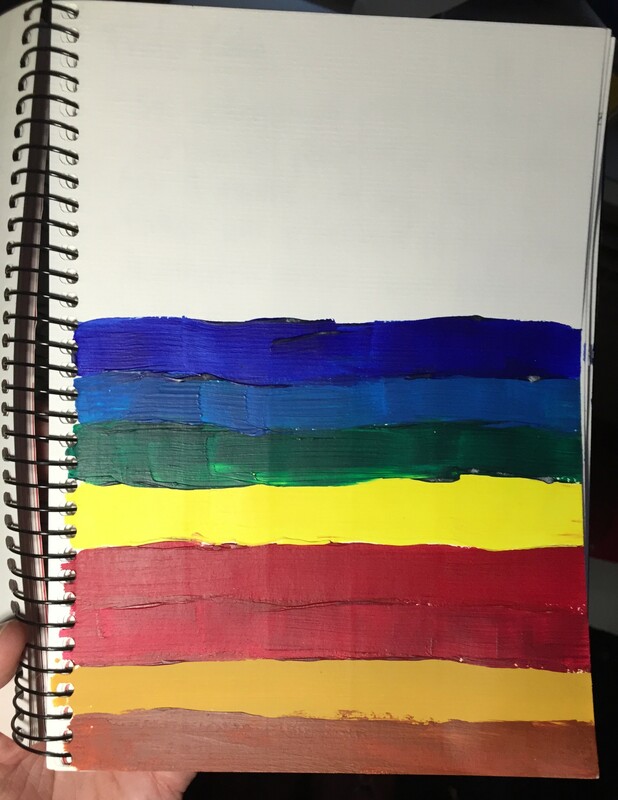 I learned a lot about how to craft colors with acrylic paints. 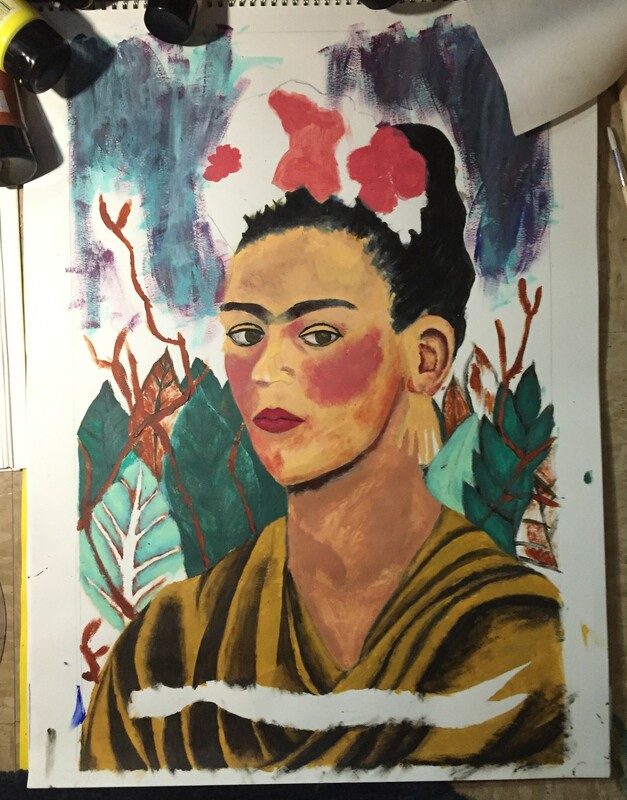 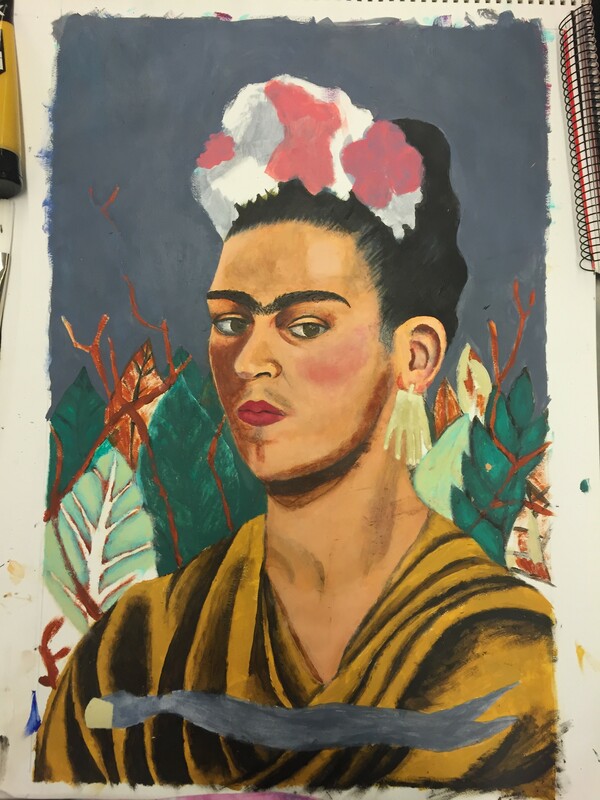 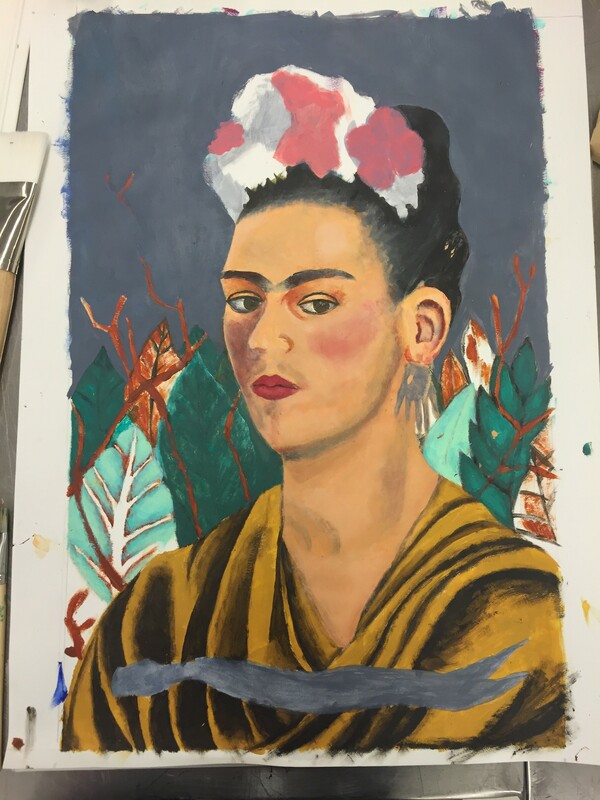 Frida used oil paints and I understand why; blending became very difficult at times while using acrylics. 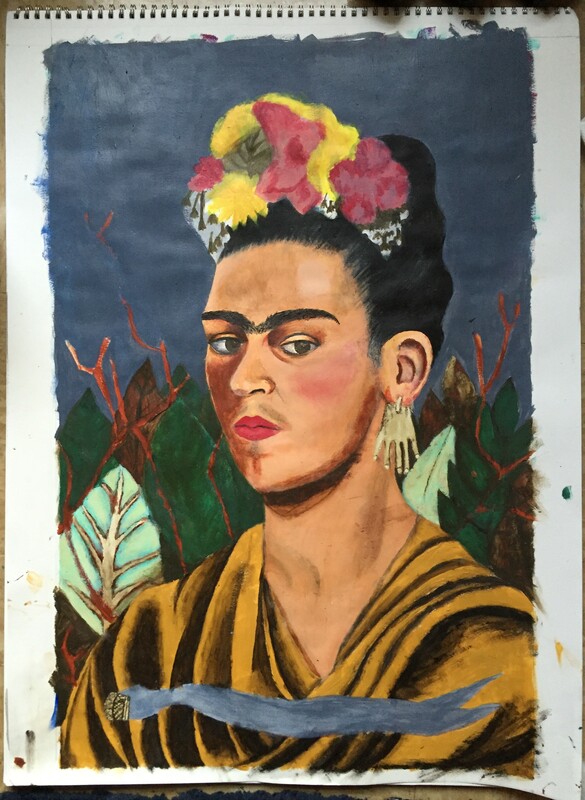 It was a very long process (over 50 hours), but it taught me a lot and I enjoyed creating the reproduction. 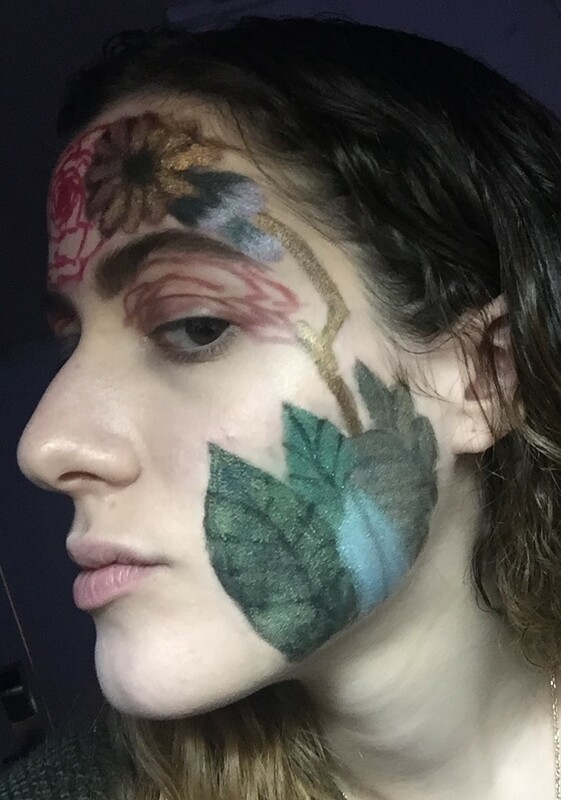 I drew a lot of inspiration from her foliage and floral arrangements. 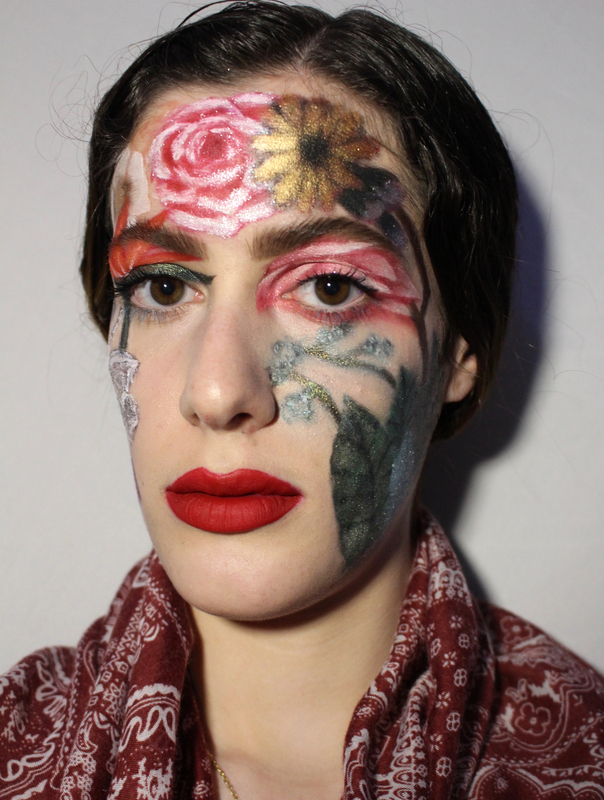 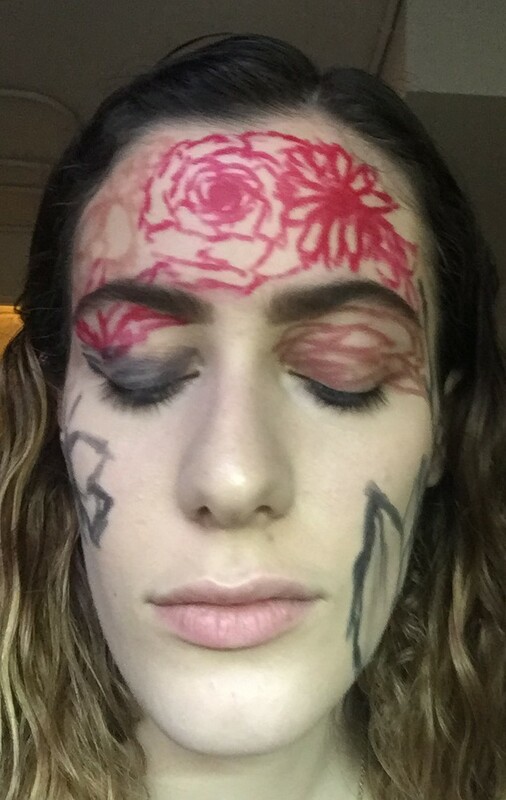 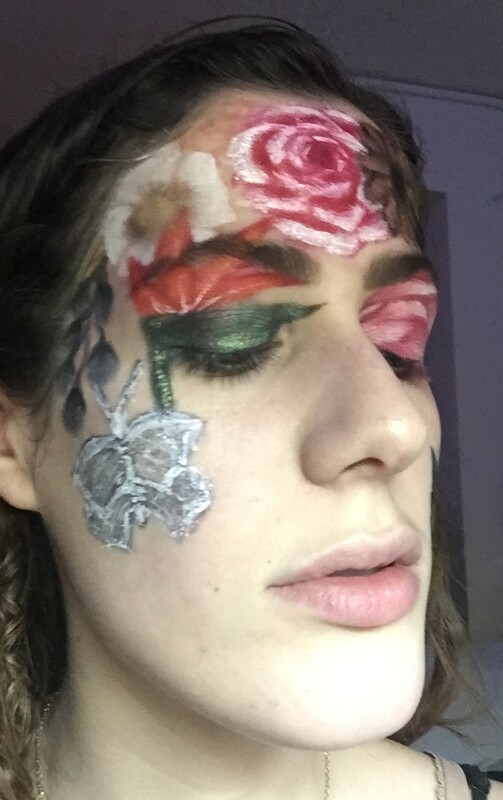 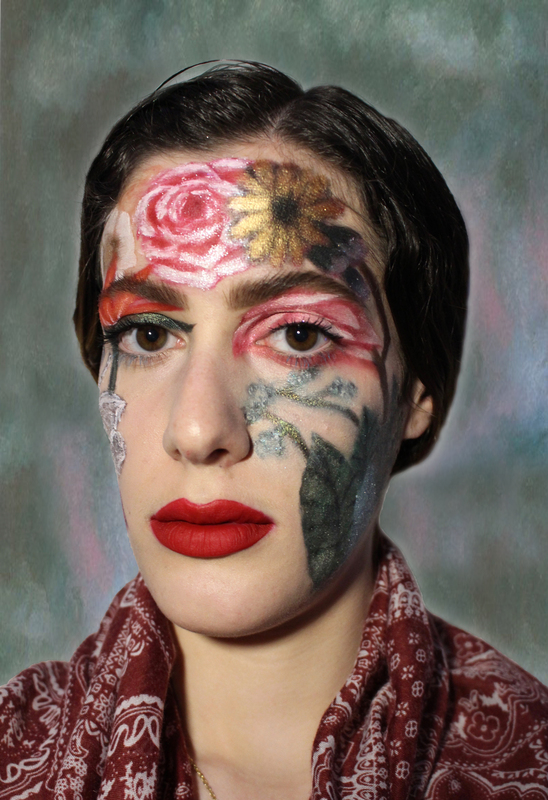 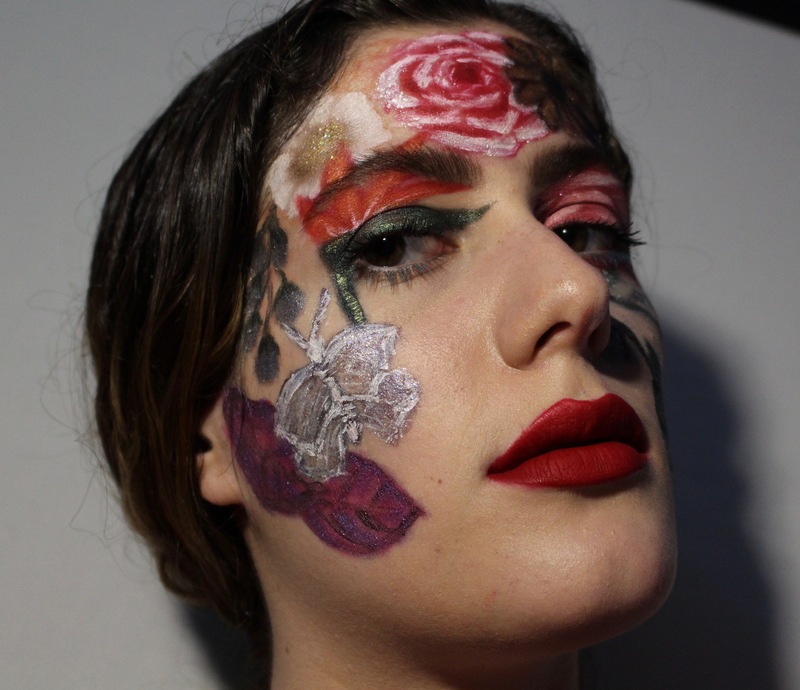 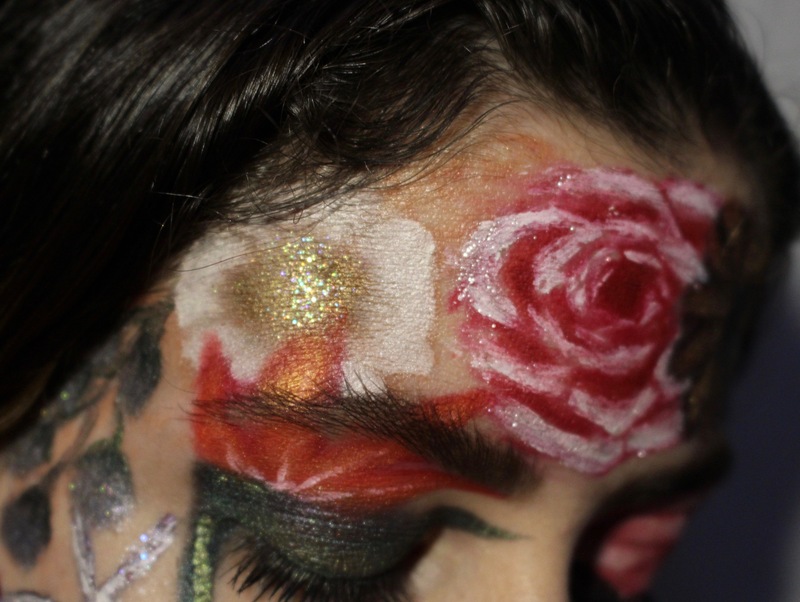 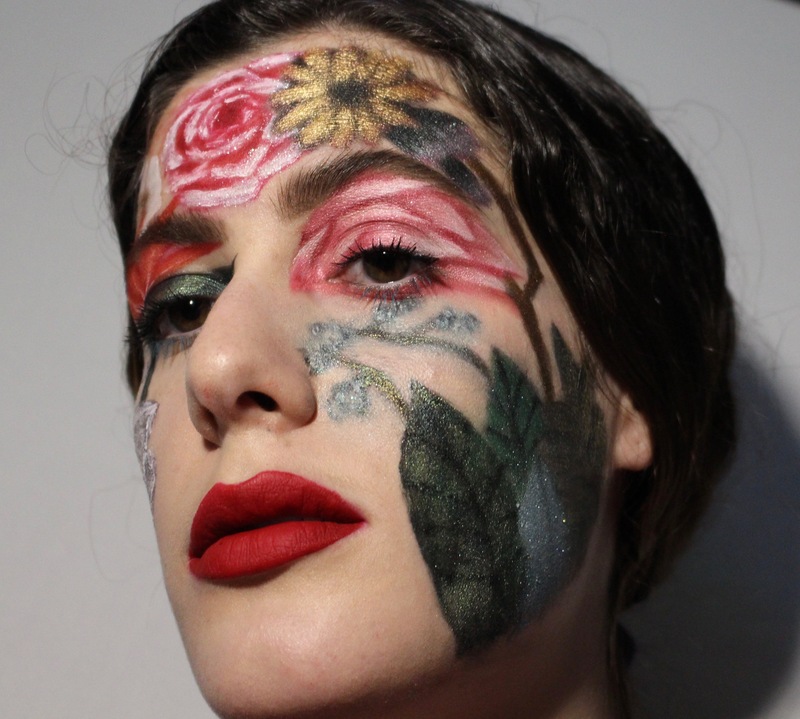 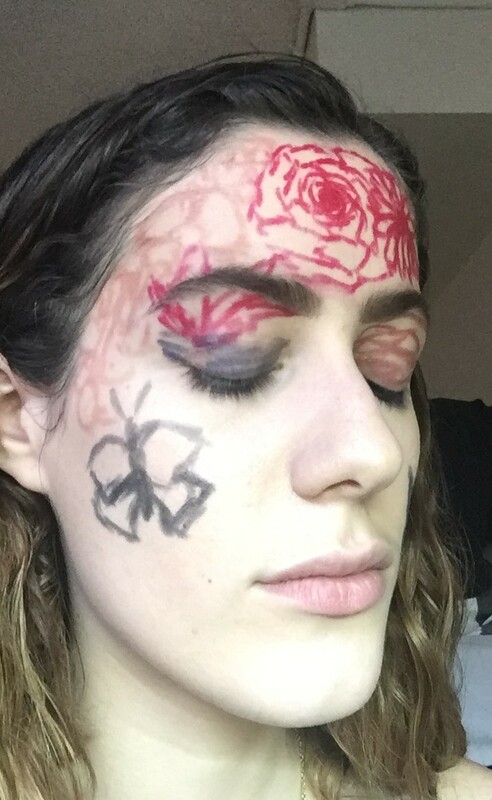 I decided I wanted to use makeup to draw her kind of flowers on my face and then photograph myself in the style of Frida’s portraits. 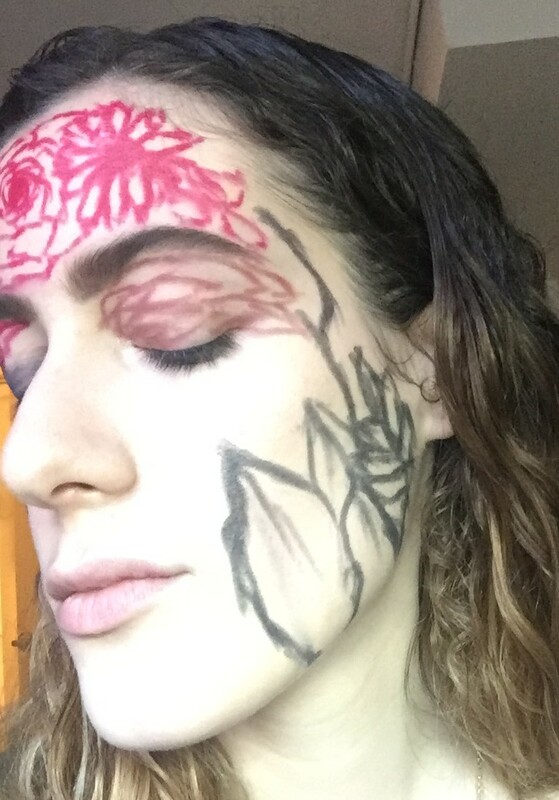 I took progress pictures at different points in the 6 hour period of sculpting the look. 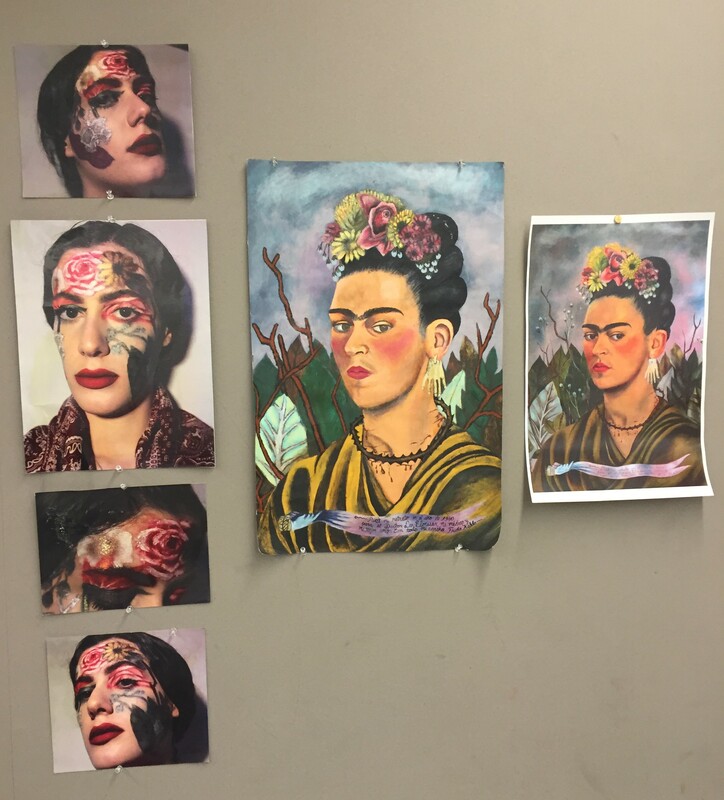 I also took pictures of my setup for the critique. 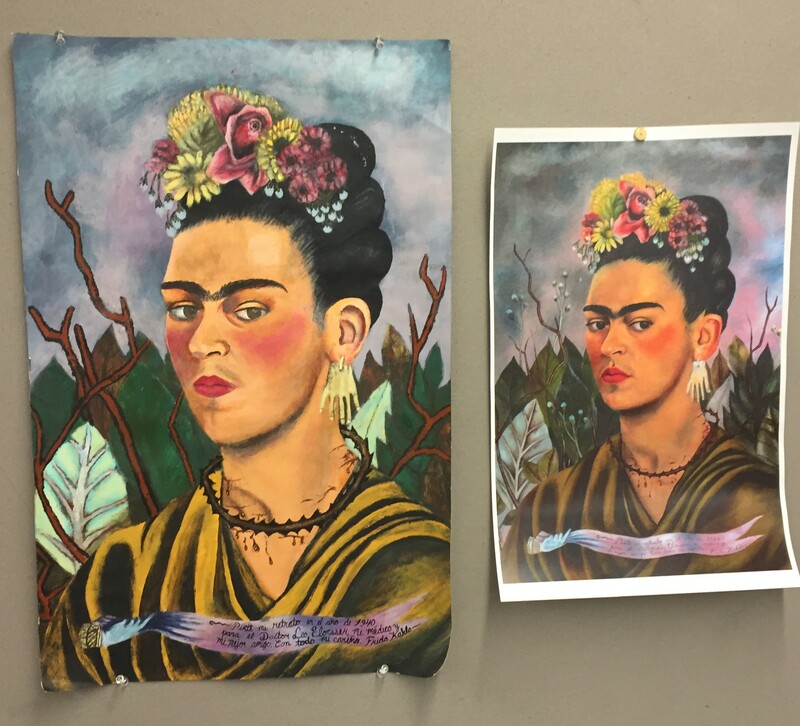 During the critique, it was suggested that I should have a background for my main photograph that emulates the Frida painting. 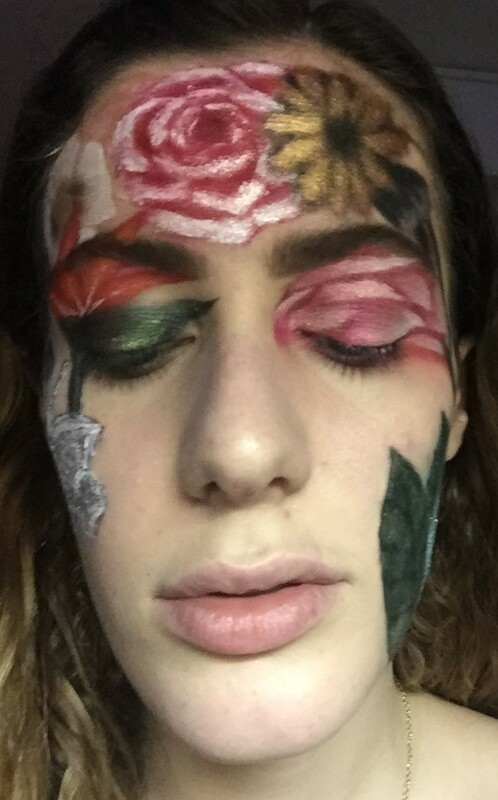 I worked on the photograph a bit to perfect it.